This Great Garden Gnome Massacre Statue is a humorous twist on the classic garden gnome statue. 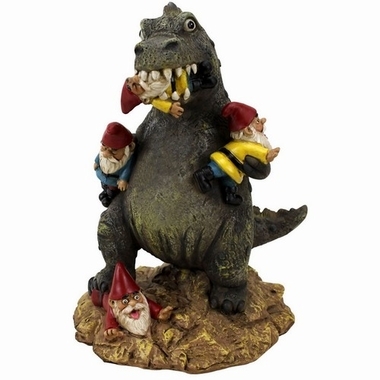 Shock your neighbors with this outdoor garden statue of adorable, bearded gnomes being eaten alive by a Godzilla-like reptile. It's all fun and games with this statue until your neighbors garden sculptures begin to mysteriously disappear into the stomach of this giant lizard beast. This funny garden gnome is suitable for any outdoor or indoor location in and around your home! Availability: The Great Garden Gnome Massacre Statue ships within approximately 1 business day.